Rock till you see red! This outfit was inspired by the late Lux Interior, feral frontman of one of the greatest and lowdown dirtiest rock n’ roll bands in history, The Cramps. He was a filthy beast, a rock animal, the creature from the black leather lagoon. He rolled around on stage in a thong much of the time, but in a few photos, I’ve seen him fully dressed in something like this. 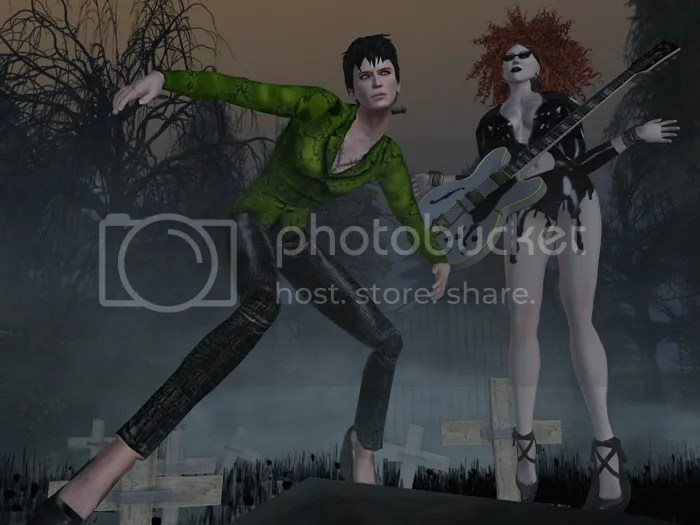 Tomorrow night, October 31st, at my club Soundproof , at 9pm SLT, I’ll be starring as Lux (with a different skin and shape than I’m wearing here) and my partner as Poison Ivy Rorschach (the av she made of Ivy is pictured on the right) in our virtual Cramps tribute show. It’s part of an all day Halloween celebration with 10 DJs starting at noon going till midnight (SLT). Long live Lux! Skin: Breeze in fair tone by the body co.